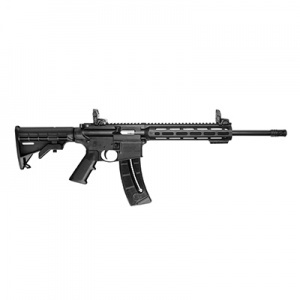 Smith & Wesson (S&W) M&P15 Rifle Line The Smith & Wesson range of .22LR Rifles are an economic, well built rifle appealing to those that want the style and look of a black military rifle from a world renowned manufacturer. The M&P15 rifle line has now been expanded by Smith & Wesson to include the new M&P15-22, which is chambered in .22LR. The rifle is built with high strength polymer upper and lower receivers, creating a reduced weight rifle that retains the style, looks and operating features of a standard S&W M&P rifle. The standard features across the Smith & Wesson M&P15-22 Rifle line are: 6 Position Collapsible Stock Functioning Charging Handle Adjustable Rear and Front Sights Two-Position Receiver Mounted Safety Selector Cartridge Case Deflector Bolt Catch Recessed Magazine Release Button High Strength Polymer Magazine Light Weight, High Strength Polymer Quad Rail Handguard Features of the M&P15-22 SPORT .22LR rifle are: 10 M&P Slim Handguard with MAGPUL M-LOK MAGPUL MBUS Folding Sights Easy to Mount M-LOK Accessories 2 M-LOK Rail Panel Included 6-Position CAR Stock Functioning Charging Handle Shell Deflector 2-Position, Receiver Mounted Safety Lever Technical Specification of M&P15-22 TB .22LR: Model M&P15-22 SPORT Caliber .22LR Capacity 25 Round Detachable Magazine Action Blow Back Semi-Auto Barrel Length 16.5 (41.9 cm Barrel Twist 1 in 15" Front Sight Folding MBUS Rear Sight Folding MBUS Overall Length 33.75 (85.7 cm) Extended, 30.70 (77.9 cm) Collapsed Stock 6-Position CAR Stock Weight 5 lbs. Barrel Material Carbon Steel Finish Matte Black Please Note: Firearms can only be transferred face to face on the production of a valid FAC, alternatively they can be shipped to a local RFD.